Yeah, he was about as succesful at that as he was about cutting the deficit in half! What's funny is the number of kook aid drinkers who believed him. 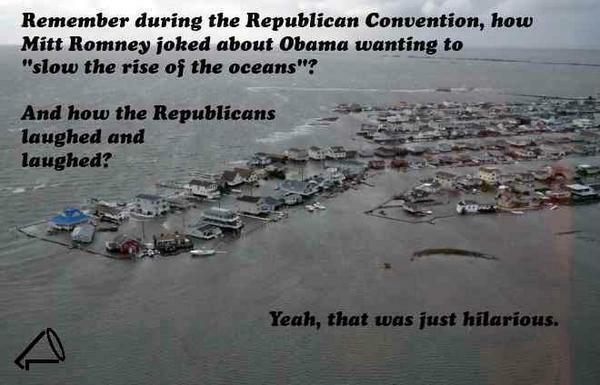 Well, JW, can Obama slow the rise of the oceans? Did he? Can anyone? Not finding the point, or reason to your post Mr Blogger. Especially knowing people died, and many are still suffering. Let's not make this natural disaster a political one... Instead lets see what we can do as a community do to help. People are suffering.. It was a hurricane, you fools. They have happened before, they will happen again. This will be censored as it kills the entire thread. Taking advantage of a very recent tragedy just to insult the republican party is a cheap shot at best in my opinion. Opoib who has friends who lost homes and all their possessions to Sandy. Lost on the above posters (as is often the case)is "the point". The point, for those who need the clarification, is that Mittens mocks the very notion of climate change....whatever the cause. Consider for a moment that, against all reasonable scientific data, that changing climate patterns is not the least bit related to human behavior, a "natural" swing of weather patterns if you will. Mittens proposes doing nothing to prepare for the inevitable rising of the tides, extreme cold, drought, heat, and rain that come with changing weather patterns. I submit this is either willful ignorance or blatant pandering to a less than educated voting public. Besides, doing the right thing is almost always more expensive than doing what is expedient and popular. And with Mittens, you get what the corporations pay for. Alas, to do nothing is akin to watching a home burn with a family inside and not fighting the fire because it's too hot... and laughing while it burns. "Yeah, that was just hilarious". Perhaps the post is directed at the head-in-the-sand attitude of the GOP with regard to global climate change. In the face of all the evidence and the worldwide consensus of PEOPLE WHO ACTUALLY KNOW WHAT THEY'RE TALKING ABOUT, how willfully ignorant does one have to be to not see the implications of continuing our abuse of the planet. Global warming... is now the reason for the Super Storm according to the LEFT. Really? But with Katrina, it was not global warming, but all George Bush's fault!! Today in NYC and NJ there is a lack of fuel, food, clothing, shelter.. FEMA is where? Does global warming effects memories of some? Yeesh...hurricanes can been around far before all of us my green buddies! Get my 'point'!! Science: The president who said he'd slow the ocean's rise says voters can regulate the weather and stop droughts, floods, wildfires and hurricanes by backing his re-election. Never mind wrecking the economy in the process. In 2009 President Obama modestly declared: "America, this is our moment . .. that I am absolutely certain that generations from now, we will be able to look back and tell our children that this was the moment when the rise of the oceans began to slow and our planet began to heal." During his acceptance speech at the 2012 Democratic National Convention, he doubled down. No matter how much damage his war on fossil fuels has done to job and economic growth, "my plan will continue to reduce the carbon pollution that is heating our planet — because climate change is not a hoax." Our carbon emissions have declined — but due to the free market, not to any presidential plan. The Energy Information Agency, a part of the Energy Department, recently noted that energy-related U.S. CO2 emissions for the first four months of this year fell to about 1992 levels, a 20-year low. The report documented how the natural gas boom in the U.S. caused by the use of hydraulic fracturing, commonly known as fracking, has helped the environment in a major way while, unlike the Environmental Protection Agency's war on coal, also creating jobs and economic growth. In Charlotte, N.C., the president noted that we have "a hundred-year supply of natural gas that's right beneath our feet." He did not say the Environmental Protection Agency and environmentalists have opposed fracking and the natural gas boom is being led by private companies on private or state-owned land. Climate change is a hoax, and so is the president's energy policy. China has passed us as the world's largest carbon emitter and builds the equivalent of a coal-fired power plant big enough to power a city the size of San Diego every seven to 10 days. Yet we have experienced a decade of cooling, so much so that scientists at Britain's Climatic Research Unit created a major scandal by manipulating and editing data to famously "hide the decline" in global temperatures. As for rising sea levels, Nils-Axel Morner, former head of the International Commission on Sea Level Change, says that an apocalyptic rise in sea levels was never in the cards. Despite fluctuations down as well as up, "the sea is not rising," he says. "It hasn't risen in 50 years." If there's any rise this century it will "not be more than 10 cm (four inches), with an uncertainty of plus or minus 10 cm." Despite computer graphics in Al Gore's Oscar-winning, "An Inconvenient Truth" showing Shanghai and San Francisco half-submerged, the seas have not engulfed us. Islands such as Tuvalu that were supposed to disappear under the rising seas are still there. "More droughts and floods and wildfires are not a joke," proclaimed President Obama. "They're a threat to our children's future. And in this election, you can do something about it." Except we are not experiencing more droughts and wildfires, and it doesn't matter how many Chevy Volts we are forced to buy. As Marc Morano documents at Climate Depot, all the world's most devastating floods occurred before 1976. The U.S. has been experiencing less and less drought since the Dust Bowl of the 1930s. Deaths due to extreme weather are radically declining, global tropical cyclone activity is near historic lows and the frequency of major U.S. hurricanes has diminished. Obama says he can stop droughts and floods, but he was unable to stop a 30% probability of rain that convinced him to move his speech indoors at Charlotte. It's policies like his that are a threat to our children's future. Everyone admits there is climate change. However, man does not cause it. Emails from those that propose this ridiculous theory proved the data they used was fraudulent.